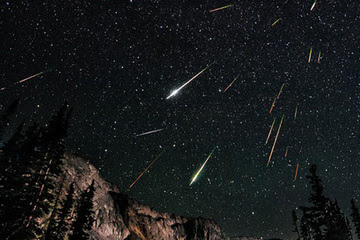 The 2015 Perseid meteor shower will peak around August 11. The new moon on August 14, 2015, will create perfect conditions for watching the meteor shower. In the Northern Hemisphere, the annual Perseid meteor shower probably ranks as one of the best and most popular meteor shower of the year. This epic event takes place during the dog days of summer when many families are on vacation. As this time of year offers comfortable temperatures in during the overnight hours, this allows us to lay back under the stars for hours and enjoy this spectacular display of comet debris. 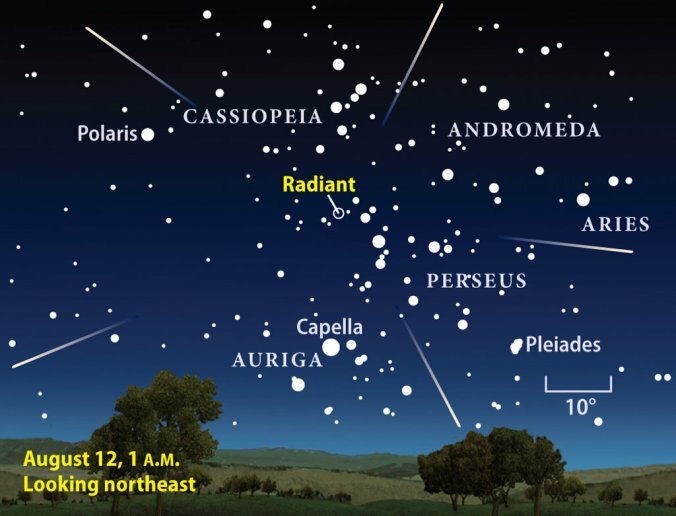 No matter where you live worldwide, the 2015 Perseid meteor shower will most likely be fine on the mornings of August 11th through the 14th. On a dark, moonless night, you can often see 50 or more meteors per hour from northerly latitudes, and from southerly latitudes in the Southern Hemisphere, perhaps about one-third that many meteors. Fortunately, in 2015, the waning crescent moon comes up shortly before sunrise, so you’re guaranteed of dark skies for this year’s Perseid meteor shower. Thus, on the Perseids’ peak mornings, moonlight will not obscure this year’s Perseid meteors. For observers in the Southern Hemisphere, the Perseid radiant never climbs above the horizon, which will considerably reduce the number of Perseid meteors you are likely to see. Nevertheless, on the night of maximum, it is possible to see 10-15 meteors per hour coming up from the northern horizon. There are other, weaker meteor showers going on around the same time as the Perseids, but the Perseids will generally appear to move much faster across the sky than meteors from the other showers. In fact, the Perseids are among the fastest moving meteors we see every year. Another way to know if the meteor you saw was a Perseid is to trace the meteor backwards. If you end up at Perseus then you have probably seen a Perseid meteor! If you are not sure where Perseus is in the sky, the following chart pictured to the left will help you find it from both the Northern Hemisphere and Southern Hemisphere. Where do the Perseids come from? - Made of tiny space debris from the comet Swift-Tuttle, the Perseids are named after the constellation Perseus. 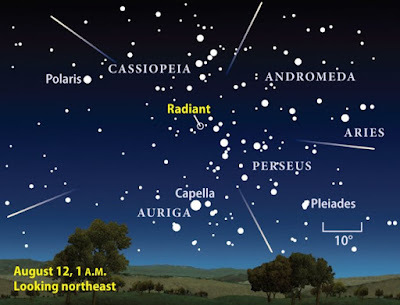 This is because the direction, or radiant, from which the meteor shower seems to come in the sky lies in the same direction as the constellation Perseus, which can be found in the north-eastern part of the sky. While the skies light up several times a year by other meteor showers, the Perseids are widely sought after by astronomers and stargazers. This is because, at its peak, an observer can see 60 to a 100 meteors in an hour from a dark place. If you have a chance to get away for a long weekend with the family and you live in the New England area, be sure to look into the annual Stellafane Convention. It is a gathering of amateur telescope makers and astronomers from around the globe. Due to the convention falling on the weekend of August 15th this year, along with the non-existing moon in the sky, the dark skies will provide excellent viewing for the Perseid meteors. Even though the peak will be over on August, 14th, there will be still many meteors to catch for about a week after.